Nadine Labaki’s angry, funny Lebanese drama arrives with quite a reputation, having earned a Best Foreign Language Oscar nomination, and a 15-minute standing ovation at Cannes, but its premise is not that easy to take. Zain (Zain Al Rafeea), though only around 12-years-old, is languishing in Beirut’s notorious Roumieh prison, but has decided to launch a lawsuit against his parents for letting him get born. We then find out that this stunt was encouraged by a current affairs TV show, and Ms. Labaki makes a brief cameo as the boy’s lawyer. That seems like a bit of a stunt as well, but this absurd premise is given context when we find out the kind of life young Zain has led. His parents are petty criminals who do little to shield him from the incredible hardships of life in Beirut, where violence is rife and shelter hard to come by. For Zain, the last straw comes when his parents sell his younger sister into marriage to a creep. He runs away, ends up in a quasi-family of his own, and will face moral dilemmas himself. 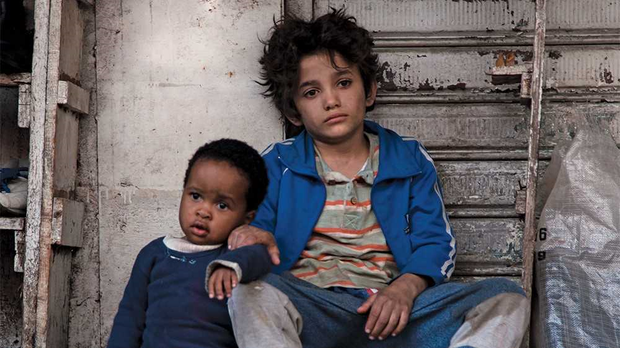 Nadine Labaki’s film is frantic, fast, full of colour and feeling and bursts of raw humour. It’s not a perfect film, but it is a fine one.